We get down every Wednesday evening from 7-8pm and Sundays from 4-5pm at Perceptual Motion Dance Studio. The studio opens 15 minutes before class and we do our darndest to start on time. The cost is $5 to cover studio rental and equipment. 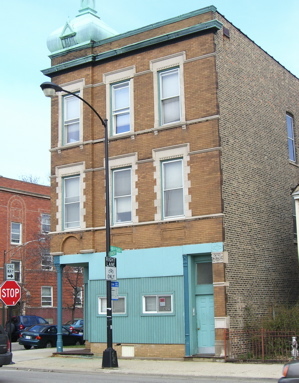 Located on the bottom floor of a three flat on the SE corner of N Damen Ave and W Belle Plaine Ave. The entrance is in THE BACK of the building – so walk East on Belle Plaine and enter the first wooden gate on your right hand side. How to get there: Options abound! Brown Line: Exit at the Irving Park stop and walk one block West on Irving Park to Damen, then hang a right and walk one and a half blocks north on Damen. Brown Line option 2: Exit at the Montrose stop and walk one block West on Montrose to Damen, then hang a left and walk two and a half blocks south on Damen. Bus: Take the #50 Damen bus and exit at Belle Plaine. The studio is right in front of you! or take the #80 Irving Park bus and exit at Damen. Walk north to 4057 N Damen. There is plentiful unmetered, unzoned street parking in this area. Damen Ave is a great bike route. Why not get a little more exercise on your way to and from class?